CORAL GABLES, Fla. – A robbery was reported Friday at a Capital Bank branch in Coral Gables, police said. 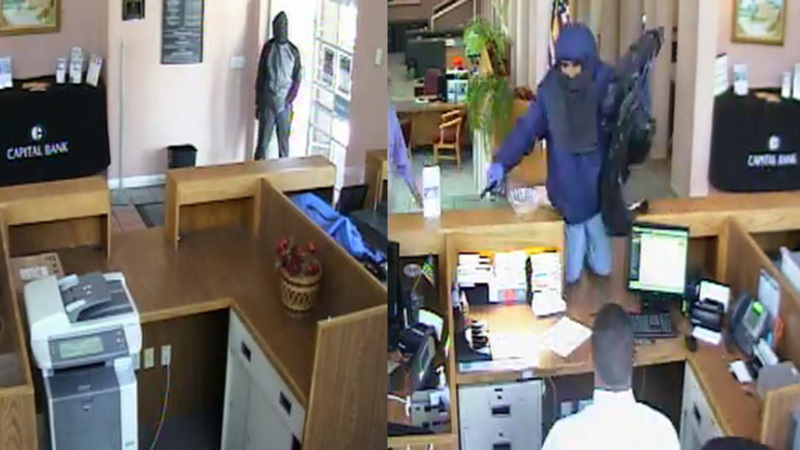 A Coral Gables police spokeswoman said the robbery was reported at the Capital Bank at 1390 S. Dixie Hwy. Sky 10 was above the scene shortly before 1 p.m. as police and FBI agents were at the scene. Police said the FBI has taken over the investigation. According to agents, two armed men, who were wearing gloves and hooded jackets covering part of their face, entered the bank at 12:07 p.m. and demanded money from employees. Authorities said there were customers inside the bank, but no one was injured. The men got away with an undisclosed amount of cash. Agents said they left in a black Ford Ranger XLT. The same vehicle is believed to have been used as a getaway car in bank robberies reported Sunday in Miami Shores and Tuesday in Hallandale Beach. Roads near the University of Miami were briefly shut down in the area during the investigation. Agents said the robbers should be considered armed and dangerous. Anyone with information about their identities is asked to call the FBI at 754-703-2000. Copyright 2016 by WPLG Local10.com – All rights reserved.